Tales From A Geordie Goth : A New Fuse + New Light Bulb = Happiness. I wanted to share one of my achievements. 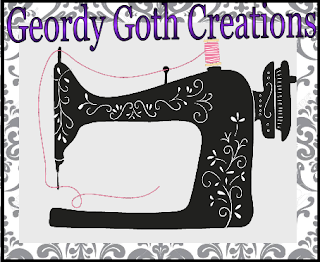 As part of my New Year goals, I want to expand my DIY skills. Well, tonight I've expanded my DIY skills again. A couple of nights ago, I banged my lamp on the table, I'm clumsy. I banged the lamp on the table and ever since it hasn't lit up despite, my attempts changing the light bulbs. I purchased cheap bulbs, and they've blown serval times, I guess that the consequences of purchasing cheap bulbs. So, after a basic lesson on electricity and circuits from the boyfriend, I assumed the fuse had blown. 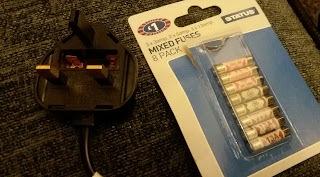 After a trip to the shops I purchasing some LD bulbs, and a pack of fuses for a pound. I replaced the fuse on the plug and used an LD light bulb the lamp has really lit up like a Christmas tree. I'm so happy I don't replace the light, as I love it and a bargain at £11 from Pound Stretcher. 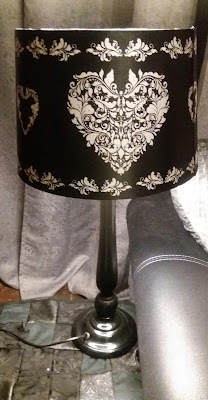 I love the shape and style along with the silver patterned lamp shade.It suits my decor. Sometimes it's really the small things, that can bring the most happiness for me. That's my first attempt time changing a fuse so not doubt I'll be changing many more in the future. This is my first and last time. I'll post about it. It's such a cute lamp! Thanks, I love it as suits my sitting room decor. I totally agree it amazing to think how easy some these skills and by learning them. So, your saving money, reducing your impact on the environment and saving something you love. It's such an amazing feeling. I love the lamp! Well done Sarah! You should be very proud of yourself!! Big Hugs! Big hugs back. I was feeling so stoked about it. Good for you! Interesting about the fuse... lamps here in the States don't have a fuse in the plug. The lamp and shade are so pretty! Thanks. That interesting to know that America don't use fuses. I wonder the reasons for that. I loce this lamp and so, happy it doesnt need replacing. I was so happy it could be fixed. Thanks I think rewiring a lamp is definitely the next stage I want to acheive butbit might be better left alone incase I blew myself up. But that may come in time. I'm find quite interesting how the Uk seems to have fuses but other countries don't. I'm sure if Europe uses them as often I need adopter plugs. Replacing the refuse is really easy, but I'm totally useless at electricity.